Crooked smiles and crowded teeth can make you feel a little self-conscious about giving the world your biggest grin. At Naidu & Naidu, we've got a few options to help you improve your smile and bring that spring back into your step. In some cases, we can look to a classic smile makeover as a solution and, using cosmetic dentistry, we could achieve great results. But if your teeth are in a good condition, we would consider a short period of orthodontic treatment to realign your smile. Now, when most people think of orthodontics they have a picture of wearing metal 'train track' braces for 2 to 3 years. Fortunately, we have a more aesthetic and convenient option available for adult orthodontics. Using the Six Month Smiles cosmetic orthodontic system, we can provide clear fixed braces and tooth-coloured wires that don't catch the eye to improve your smile within 4 to 9 months. In fact, the average time of treatment is only 6 months, so you could even have your new smile in the time between dental check-ups! 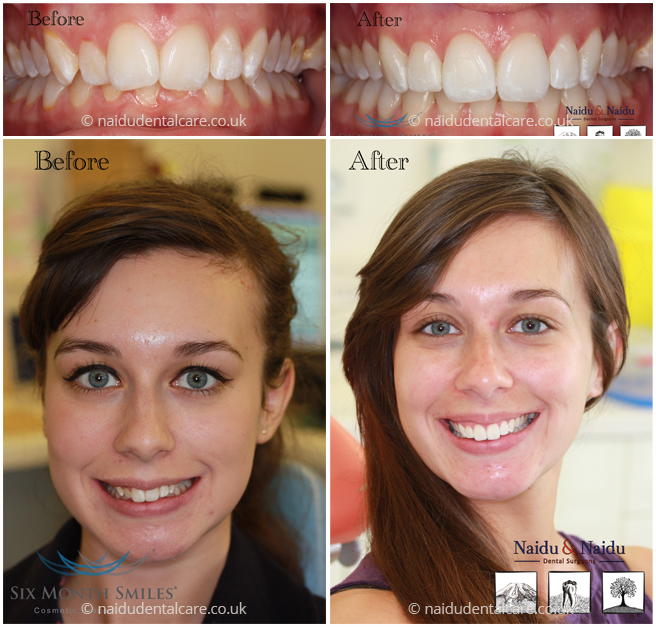 So, if you're interested, give us a call and ask for a Six Month Smiles consultation with Adit Naidu. After only 6 months of cosmetic braces and a little touch of whitening, years of being self-conscious about smiling just melted away! A lovely outcome with minimum fuss! With a few months of alignment and some tooth whitening, we’ve got a smile that brightens up the room! By straightening severely overcrowded teeth, we don’t just improve smiles, it’s also a lot easier to brush around these areas!